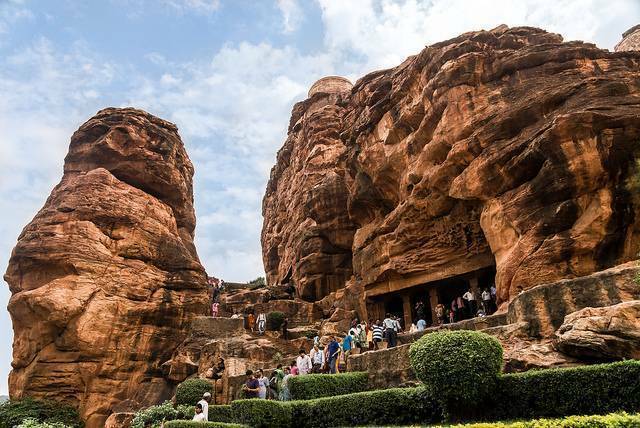 Badami Caves are a popular tourist attraction and is filled in with tourists all round. The Badami caves are a set of four beautifully carved sandstone temples. These caves belong to the Chalukya period. Out of the four caves here, the first three caves have temples, which have been devoted to Hindu Gods, and the last cave houses a Jain temple. Architecturally all the caves share similar plans. . All the caves have a porch with columns and brackets leading towards the main hall. The Maha mandapa is in a tiny sanctum that homes the sculpture.